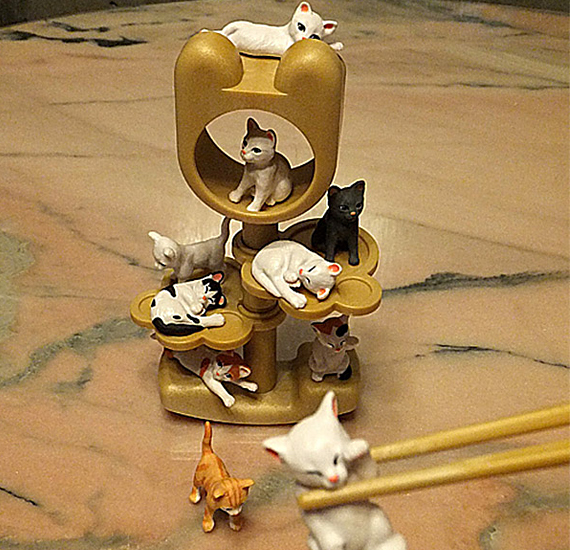 Tiny Cats Chopstick Game Fun Time Go! Do you know how to use chopsticks? It’s kinda rough if you don’t. You have to decide whether the embarrassment of getting your chopsticks “rubber-banded” at Japanese restaurants outweighs your lack of interest in practicing at home. But if you pick up the Cats Balancing Brain Training Game you’ll be a pro in no time. The set comes with a mini cat treehouse and 10 adorable tiny cats posed in a variety of super cute positions. Some are sleeping, some are stretching, and one is doing the “lucky kitty’ paw up thing. They’re so cute I could eat them with a spoon! But I won’t… because you’re supposed to use chopsticks. Plus,eating plastic makes my tummy sad.